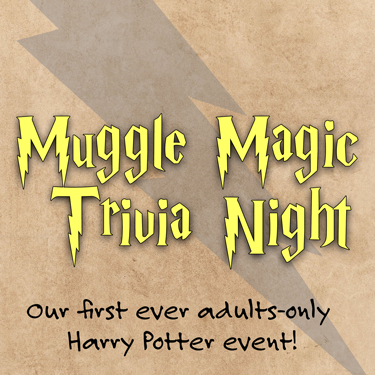 Our first ever adults-only Harry Potter event will be a fundraiser for our annual Harry Potter Party, which grows bigger every year! Test your Ordinary Wizarding Levels at our Trivia Quiz. Get your fancy dress on and try the sorting hat, take a photo with your friends at Creevey’s photo booth, have some treats at Honeydukes. Bring extra cash for shopping at the best Harry Potter store in Nova Scotia, Gladrags Wizardwear & More pop-up shop. Prizes for the best costumes. Tickets are $25 and include Trivia, chili, a Honeydukes treat, and one free Green Screen photo shoot. Bring cash for bar and shopping. Form your teams now (no more than 4 per team). Only 100 tickets will be sold. Tickets available at Wilsons Pharmasave in Berwick, and at the Berwick Library. To ask about delivery of tickets to another AVRL branch, phone the library during open hours at 902-538-8060.